As art lovers, we get super excited when we have the opportunity to curate an experience around it. When pairing wine with art, our intent is to heighten your senses and facilitate a deeper connection with both the art and wine. To us, it's important to learn about the artist's story. What was the artist's state of mind during the creative process? What was the inspiration? When were these pieces created and why then? We collaborate with the artist to analyze the artwork and develop themes to help with the wine selection. The world of wine is vast, so narrowing it down to a selection that helps to create an immersive, dynamic experience is our goal. 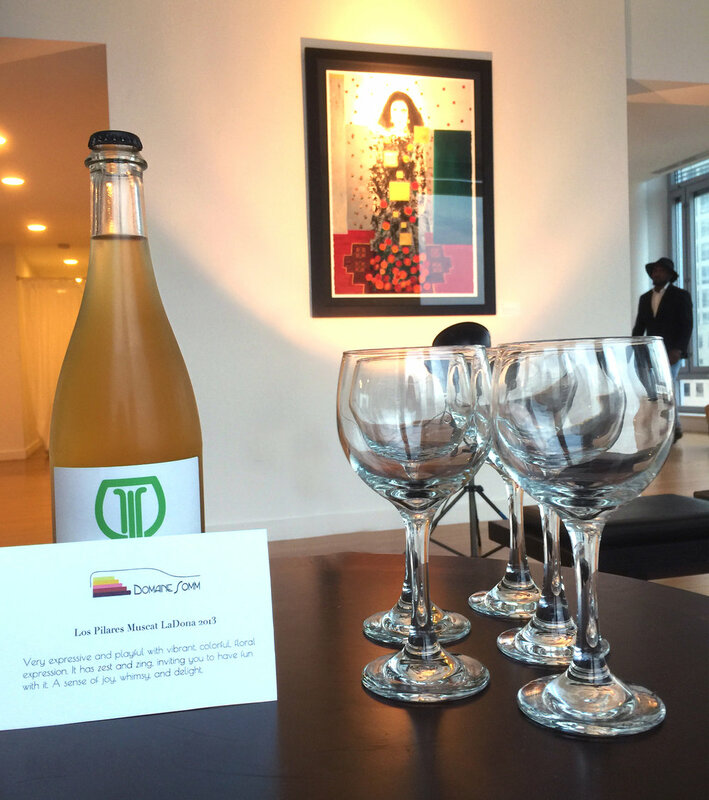 We recently curated a wine pairing experience with the artist, Kasra Namvari, and his exhibit, Blackout Dreams. In speaking with Kasra, we identified three key themes which served as inspiration for the pairings. The most recently created pieces express a happier period in the artist's life when he decided to join his girlfriend in New York City. There is a sense of wonderment, whimsy, and playfulness with heavy use of flowers as well as bright colors. We paired these pieces with the Los Pilares Muscat LaDona 2013. It is a pet-nat made with the highly floral muscat grape from an unexpected place, San Diego. The wine is fun, bright, and whimsical. It was made as an experiment and turned out to be a stunner. In some ways, it was a leap of faith similar to Kasra's decision to move to NYC to be with his girlfriend and start a new adventure. Another theme we derived from his art is darkness, exhibiting feelings of being challenged, unstable, and full of angst. This was a period when Kasra and his girlfriend were physically and emotionally separated. The darkness depicted in the art led us to choose a wine that is particularly tannic - almost a bit harsh upfront with an intense, brooding sensibility. The wine needed to show a lot of depth to match the layered emotions that the artist exudes through these pieces. We selected the Perliss Estate "The Raven" 2011, a premium, age-worthy Napa Valley wine made with 100% Cabernet Sauvignon. In Greek mythology, ravens are associated with Apollo, the god of prophecy. They are said to be a symbol of good luck, and were god's messengers in the mortal world. In all of these dark pieces, there is a distinct glow that is visibly distracting. Perhaps an omen of better times to come. A FADING MEMORY. A STRONG SENSE OF PLACE. The subject matter in these pieces is the forest in northern Iran where Kasra used to visit as a child. The series shows his fading memory of this forest, a place he remembers fondly, yet not so vividly. With a distant memory, new evolved impressions may alter reality and lead you to form a new version of the experience. When selecting the wine pairing, we focused on the structure of the wine - one that really allows for the wine to evolve and result in a lingering, almost transformative finish. There is a sense of familiarity of fruit flavor when you first taste this wine, but then it takes on many different layers of impressions that are more savory, earthy, and wild...almost transporting you to the wilderness. The vineyard site is a unique location where the vines are own-rooted in 40 ft deep banks of beach sand alongside the Sacramento River Delta. This distinctive terroir and ancient vines contribute to the wine's capacity to transform and evolve as you taste. The label's look and feel added a nice complementary visual aid to the pairing as well. Art + wine have a way of transporting you to a different state of mind and feeling, offering new perspectives on experiences and your memories of them. This project allowed guests to experience art in a completely unexpected manner and think of wine in a new light. We thrive on creating one of a kind experiences that bring intrigue and delight. Contact us to learn how we can enhance your event with creative programming.